Photo courtesy of BYU Athletics | BYU quarterback Jaren Hall lets one fly during Saturday's spring football scrimmage at the old Provo High Schoo. Hall sparkled in the scrimmage, leading the Cougars on four touchdown drives. March 23, 2019. Provo • Presumptive starting quarterback Zach Wilson spent a lot of time standing on the sidelines and chatting with former BYU quarterback Max Hall during BYU’s open practice and scrimmage Saturday afternoon at the old Provo High football stadium. 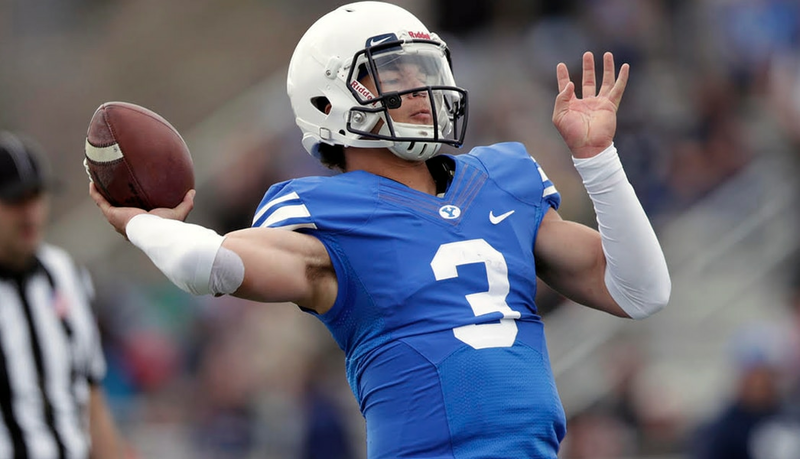 Meanwhile, presumptive backup QB Jaren Hall — not related to Max Hall, but rather the son of former BYU standout running back Kalin Hall — showed that there just might be another quarterback derby at BYU this fall. Hall, the redshirt freshman who also plays on BYU’s baseball team, played as impressively as could be imagined in the 85-play scrimmage in which coaches decided to let the quarterbacks be “live,” which means they could be tackled like everyone else. Hall got four of the 12 “possessions” doled out to the offense and led the unit on four long touchdown drives. More impressively, perhaps, he busted free for a 65-yard touchdown run, evoking memories of Taysom Hill. The TD run was nullified by a holding penalty, but the statement was made. Assuming Wilson returns at full strength after offseason shoulder surgery, coaches are going to have to find ways to get Hall on the field, too. He’s that good. Hall threw a 27-yard touchdown pass to Dax Milne and a 34-yard TD to Gunner Romney. Redshirt freshman running back Tyler Allgeier ran 5 and 8 yards for touchdowns on Hall’s two other series, the 8-yarder coming after Hall’s big TD run was called back. Head coach Kalani Sitake said he decided to let the QBs go live after consulting with Grimes and passing game coordinator Aaron Roderick, and also “because they wanted to,” especially Hall. “We really wanted to see the quarterbacks under some real pressure,” Sitake said. Redshirt sophomore Joe Critchlow was the second QB to see action, and also had some good moments, like a 30-yard strike to Tevita Ika and a 35-yarder to Neil Pau’u. But Critchlow was responsible for the offense’s only turnover, an errant pass that was picked off by reserve defensive back Mitchell Price. • Redshirt freshman Jaren Hall directs four long touchdown drives and runs 65 yards for a TD that is called back. • Coaches allow quarterbacks to go live, but defense records just a couple sacks and is pushed around most of the day. • Reserve defense back Mitchell Price intercepts Joe Critchlow for the defense’s only turnover of the day. • Gunner Romney, Spencer Romney and Darius McFarland catch touchdown passes. Critchlow engineered the final touchdown, driving the offense 75 yards for a score. Fullback/tight end Darius McFarland caught a 5-yard touchdown pass. Redshirt freshman Baylor Romney, the third and final QB to see action, threw a 30-yard touchdown pass to Spencer Romney (no relation). Allgeier, Sione Finau and Morgan Pyper got the bulk of the carries — Finau in particular showed some nifty moves and decent speed — while Lopini Katoa was held out. Kavika Fonua got a few carries in the earlier, short scrimmage, but watched the main scrimmage with an ice pack on his left shoulder. The defense held some healthy guys out as well, most notably defensive tackles Zac Dawe and Khyiris Tonga, defensive end Devin Kaufusi, and safety Dayan Ghanwoloku. Because of that, Sitake wouldn’t acknowledge what most observers went away thinking — that the offense won the day, and fairly easily. He pointed out that the young linebackers needed to get valuable reps and were burned a few times. Starting defensive end Trajan Pili, who did play quite a bit, said the defense held its own and called the day a draw.